An illustration of Cassini as it plunges into Saturn’s atmosphere. When the Cassini space probe makes its final descent into Saturn later today, data from the final nine hours of the mission will be sent back to NASA’s tracking station in Canberra, Australia. As the probe descends, it will capture images and data from Saturn and its atmosphere, revealing more of the planet’s secrets. Under the spacecraft’s normal operations, its instruments first store and later forward images and data to Earth. But in Cassini’s final hours, it will be transmitting home in real time, with the signals picked up by the CSIRO-managed Canberra Deep Space Communication Complex (CDSCC). The CDSCC is part of NASA’s Deep Space Network, one of three tracking stations around the world that provide vital two-way radio contact with Cassini and 30 other spacecraft including Voyagers 1 and 2. Cassni’s final journey in local AEST times. Cassini’s final bonanza of data, transmitted as weak radio signals, will take 83 minutes to travel 1.5 billion km at the speed of light to reach the giant dish antennas in Canberra. 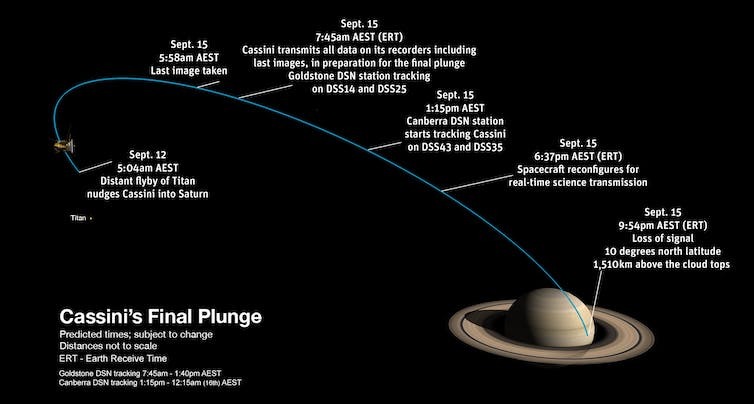 At an estimated 9:54pm AEST tonight (September 15), CSIRO’s team at CDSCC will capture the final signals as Cassini, travelling at more than 111,000km per hour, plunges into Saturn’s atmosphere. NASA decided to safely dispose of Cassini into Saturn, ending its mission as a shooting star. With the spacecraft nearly out of fuel and possible loss of control, this plan will prevent accidental collisions with any of Saturn’s moons and potential biological contamination by microbial stowaways from Earth. Viewed from Saturn, the last moments of Cassini would look similar to a meteor entering Earth’s atmosphere. 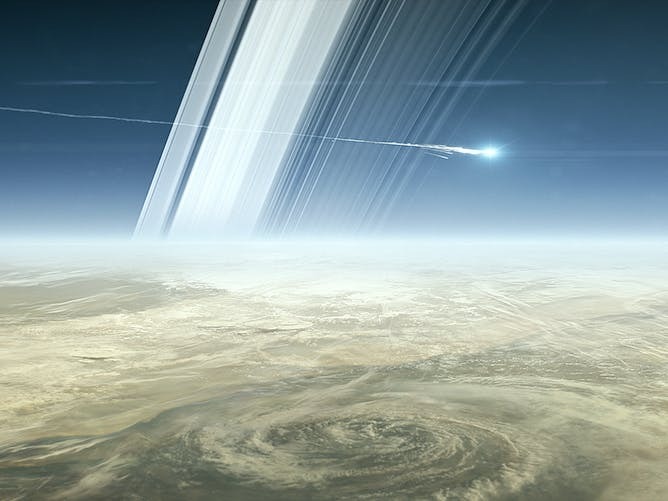 An illustration of Cassini breaking apart after entering Saturn’s atmosphere. From Earth, the world will await the bittersweet moment when NASA’s Jet Propulsion Laboratory mission control announces loss of signal. Cassini’s final call home will have been made. It will mark the end of a 20-year mission, a joint venture between NASA, the European Space Agency and the Italian Space Agency. Inspired by the earlier flypast by the twin Voyager spacecraft, the two-part mission was actually known as the Cassini-Huygens mission. The main craft was designed to study Saturn and its environs, while the piggybacking Huygens probe was to land on Titan, the planet’s largest moon. Throughout its odyssey, every step of Cassini’s journey has been followed by the dishes at CDSCC in Canberra. It was the first tracking station to make contact with Cassini after its launch from Cape Canaveral in October 1997. 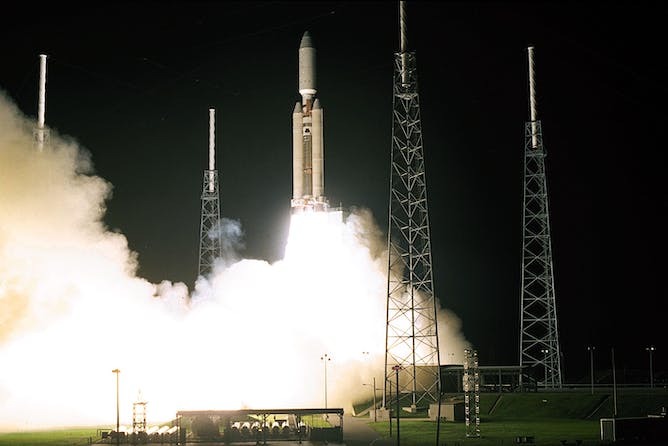 The Cassini spacecraft and Huygens probe begin their seven-year journey to Saturn after a successful launch on October 15, 1997. It then tracked Cassini throughout its seven-year journey to Saturn, handling the vital communications as it arrived and was placed into orbit around the planet in July 2004. As the first spacecraft to orbit Saturn, it has studied the planet, its rings and its 62 moons, seven of which were discovered by Cassini. In 2005 the Huygens probe transmitted data as it landed safely on the surface of Titan. This was the first landing on a world in the outer Solar System. The Huygens probe’s descent to Titan. Cassini has now witnessed almost half a Saturn year, which is 29 Earth years long. While Voyagers 1 and 2 had spectacular encounters with the outer planets interspersed by years of travel, Cassini has delivered science on a daily basis. Like a Swiss Army Knife of spacecraft, Cassini has a plethora of scientific instruments on board. 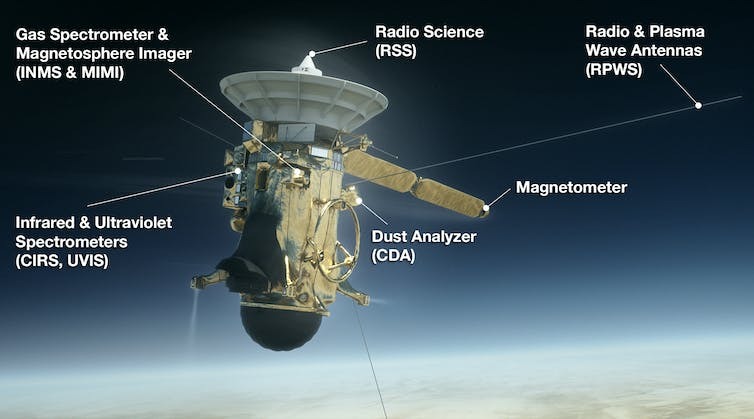 Eight of Cassini’s science instruments are planned to be turned on during the final plunge, including the Ion and neutral Mass Spectrometer (INMS). While the most inspiring data is the images, for staff at CDSCC the excitement has centred around performing dozens of unique radio science experiments with the Cassini team. 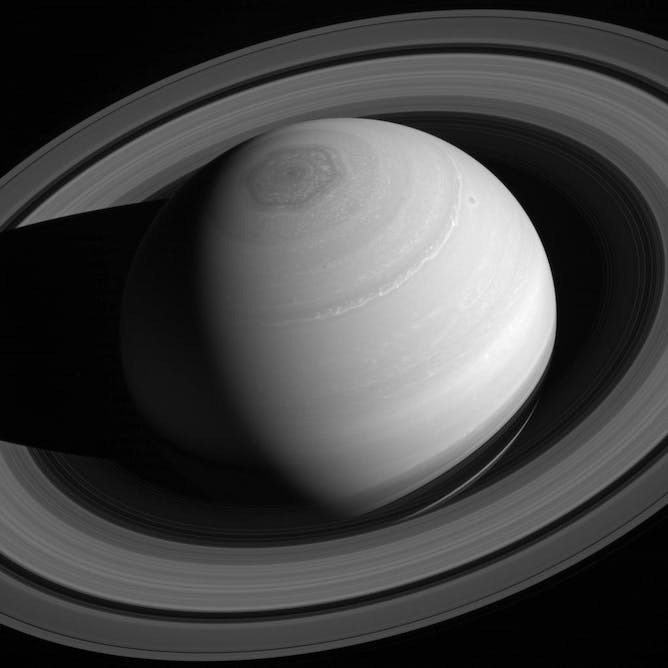 Using a process called bistatic radar, which is the deep space version of sonar, the data received made it possible to measure the size and distribution of particles in Saturn’s rings. Saturn reigns supreme, encircled by its retinue of rings. You can also see Saturn’s famous north polar vortex and hexagon. It was also used to map the terrain and depths of ethane and methane lakes on the surface of Titan. For Cassini’s final bistatic observations of Titan earlier this year, key members of Cassini’s science team travelled to Canberra to witness the data coming into CDSCC first-hand. Staff found it exhilarating to watch the pure excitement on the faces of Cassini’s team standing in their Canberra control room as the spacecraft’s faint signals were being received. Bistatic scattering reveals the details on Titan. To some of us, the data may have appeared as not much more than a slightly higher peak in a hash of radio noise, but to the mission team it meant discovering a shoreline or a lake bottom on the surface of a world more than a billion kilometres away. Being a part of these discoveries was a proud moment for CDSCC and its CSIRO team. As we say goodbye to Cassini, CDSCC continues to track more than 30 other spacecraft, not only NASA probes but also those of other international space agencies in Europe, Japan and India. The Canberra antennas still support both Voyager spacecraft for several hours each day, receiving data from the edge of the Solar System and beyond. Canberra Deep Space Communication Complex will keep track of other spacecraft after Cassini’s final plunge into Saturn. NASA’s Juno has only just begun its primary mission, transmitting scientific data as it orbits Jupiter. Its highly elliptical orbit brings the spacecraft dangerously close to Jupiter (5,000km) before retreating away from the radiation-intense planet. New Horizons, which flew past Pluto in 2015, has set a course for an encounter with a Kuiper Belt object on January 1, 2019. The spacecraft is periodically woken from hibernation to check system functions before being returned to slumber. The next few years will see a quantum shift as the Deep Space Network moves to supporting proposed human missions to the Moon, asteroids and Mars. 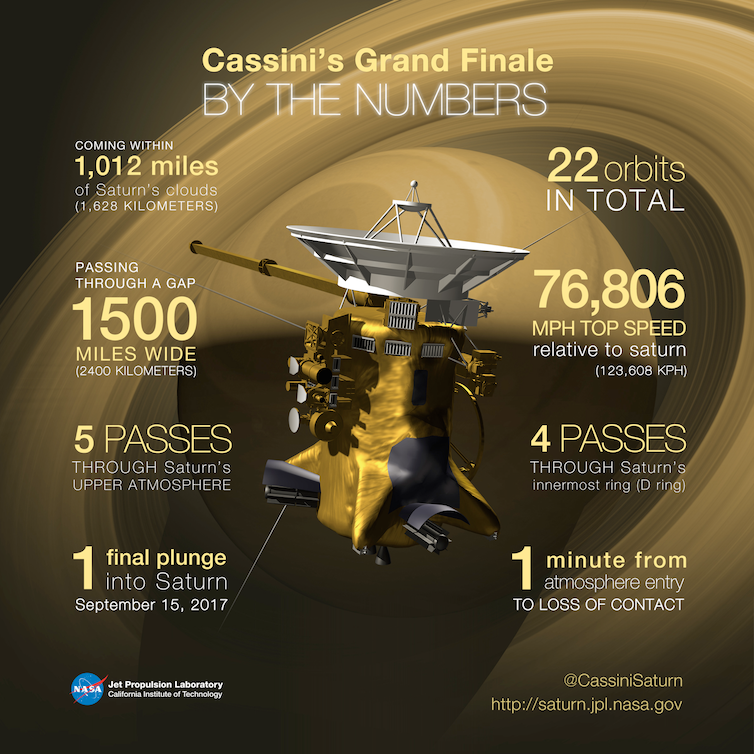 For now though, CDSCC is concentrating on Cassini’s final moments, delivering its last breath of data to NASA scientists who will continue to study the information for decades to come. Using the big 70-metre antenna dish at CDSCC as the prime receiver, it will be backed up by a smaller 34m dish. 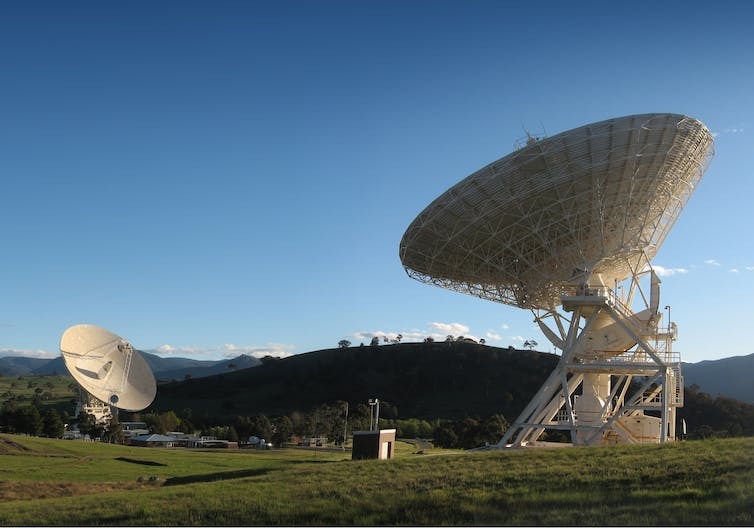 To add even further redundancy into the system, the European Space Agency has a 35m dish in New Norcia, Western Australia, which will also listen to Cassini’s radio whispers. Cassini’s final hours will be a bittersweet moment for the CDSCC team, losing a spacecraft that for 20 years had become a daily part of our lives. We will say a fond farewell to an incredible mission, safe in the knowledge that we’ve been a part of an adventure that revealed Saturn as a real place, full of wonders, for future generations to explore. NASA’s JPL Ustream live channel. You can also follow Cassini on Twitter @CassiniSaturn and Facebook at NASACassini. Clouds over Australia’s Davis Research Station, containing ice particles that activate ozone-depleting chemicals, triggering the annual ozone hole. This weekend marks the 30th birthday of the Montreal Protocol, often dubbed the world’s most successful environmental agreement. The treaty, signed on September 16, 1987, is slowly but surely reversing the damage caused to the ozone layer by industrial gases such as chlorofluorocarbons (CFCs). Each year, during the southern spring, a hole appears in the ozone layer above Antarctica. This is due to the extremely cold temperatures in the winter stratosphere (above 10km altitude) that allow byproducts of CFCs and related gases to be converted into forms that destroy ozone when the sunlight returns in spring. As ozone-destroying gases are phased out, the annual ozone hole is generally getting smaller – a rare success story for international environmentalism. Back in 2012, our Saving the Ozone series marked the Montreal Protocol’s silver jubilee and reflected on its success. But how has the ozone hole fared in the five years since? Read more: What is the Antarctic ozone hole and how is it made?. 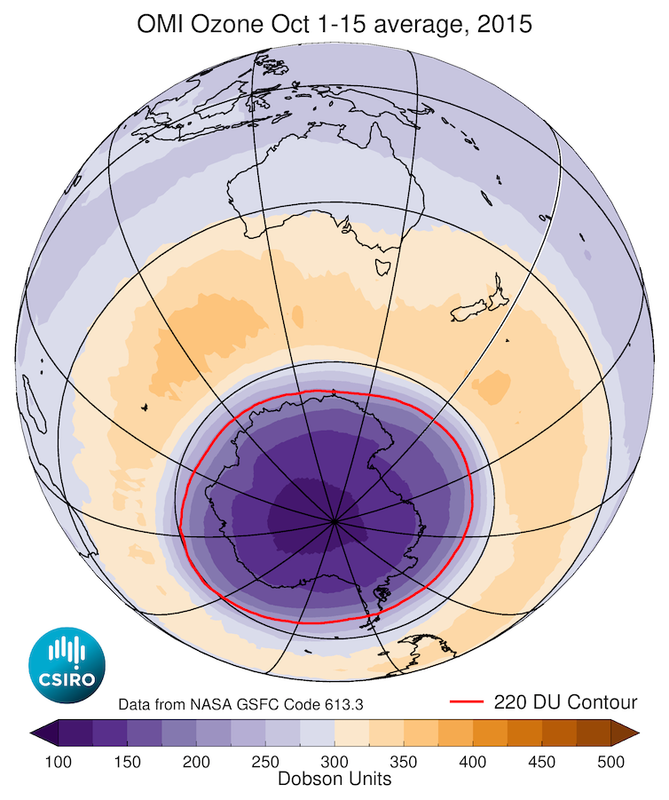 The Antarctic ozone hole has continued to appear each spring, as it has since the late 1970s. 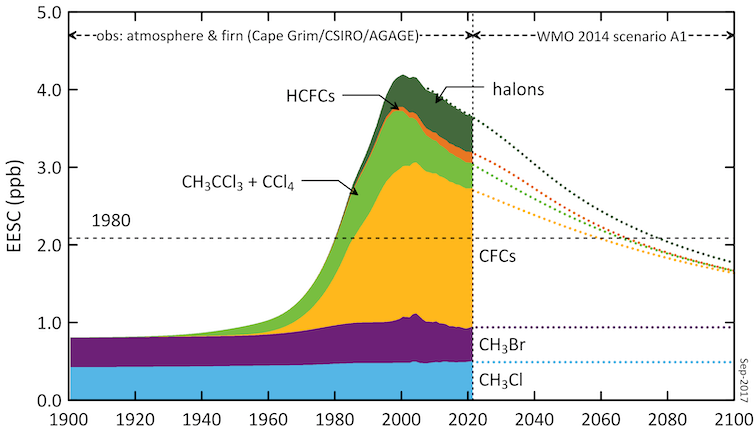 This is expected, as levels of the ozone-destroying halocarbon gases controlled by the Montreal Protocol are still relatively high. The figure below shows that concentrations of these human-made substances over Antarctica have fallen by 14% since their peak in about 2000. Past and predicted levels of controlled gases in the Antarctic atmosphere, quoted as equivalent effective stratospheric chlorine (EESC) levels, a measure of their contribution to stratospheric ozone depletion. It typically takes a few decades for these gases to cycle between the lower atmosphere and the stratosphere, and then ultimately to disappear. The most recent official assessment, released in 2014, predicted that it will take 30-40 years for the Antarctic ozone hole to shrink to the size it was in 1980. Monitoring the ozone hole’s gradual recovery is made more complicated by variations in atmospheric temperatures and winds, and the amount of microscopic particles called aerosols in the stratosphere. In any given year these can make the ozone hole bigger or smaller than we might expect purely on the basis of halocarbon concentrations. 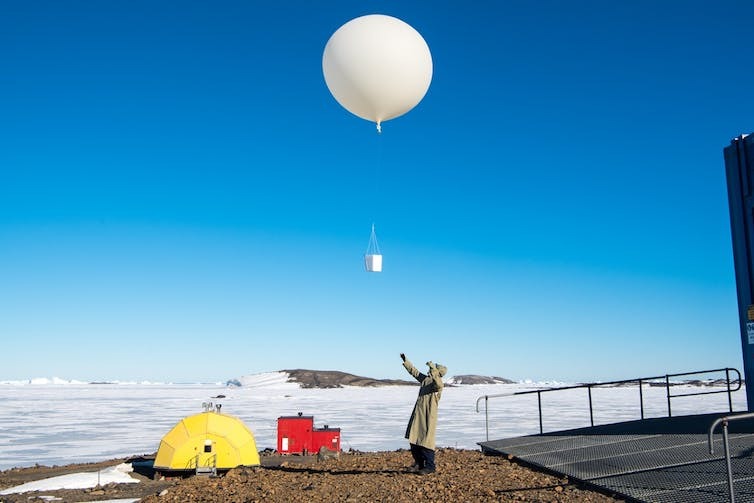 Launching an ozone-measuring balloon from Australia’s Davis Research Station in Antarctica. The 2014 assessment indicated that the size of the ozone hole varied more during the 2000s than during the 1990s. While this might suggest it has become harder to detect the healing effects of the Montreal Protocol, we can nevertheless tease out recent ozone trends with the help of sophisticated atmospheric chemistry models. Reassuringly, a recent study showed that the size of the ozone hole each September has shrunk overall since the turn of the century, and that more than half of this shrinking trend is consistent with reductions in ozone-depleting substances. However, another study warns that careful analysis is needed to account for a variety of natural factors that could confound our detection of ozone recovery. One such factor is the presence of ozone-destroying volcanic dust in the stratosphere. Chile’s Calbuco volcano seems to have played a role in enhancing the size of the ozone hole in 2015. At its maximum size, the 2015 hole was the fourth-largest ever observed. It was in the top 15% in terms of the total amount of ozone destroyed. Only 2006, 1998, 2001 and 1999 had more ozone destruction, whereas other recent years (2013, 2014 and 2016) ranked near the middle of the observed range. Average ozone concentrations over the southern hemisphere during October 1-15, 2015, when the Antarctic ozone hole for that year was near its maximum extent. The red line shows the boundary of the ozone hole. Another notable feature of the 2015 ozone hole was that it was at its biggest observed extent for much of the period from mid-October to mid-December. This coincided with a period during which the jet of westerly winds in the Antarctic stratosphere was particularly unaffected by the warmer, more ozone-rich air at lower latitudes. In a typical year, the influx of air from lower latitudes helps to limit the size of the ozone hole in spring and early summer. As noted above, the ozone holes of 2013, 2014 and 2016 were relatively unremarkable compared with that of 2015, being close to the long-term average for overall ozone loss. In general respects, these ozone holes were similar to those seen in the late 1980s and early 1990s, before the peak of ozone depletion. This is consistent with a gradual recovery of the ozone layer as levels of ozone-depleting substances gradually decline. This year’s hole began to form in early August, and the timing was similar to the long-term average. Stratospheric temperatures during the Antarctic winter were slightly cooler than in 2016, which would favour enhancement of the chemical changes that lead to ozone destruction in spring. However, temperatures climbed above average in mid-August during a disturbance to the polar winds, delaying the hole’s expansion. As of the second week of September, the warmer-than-average temperatures have continued but the ozone hole has grown slightly larger than the long-term average since 1979. Read more: Saving the ozone layer: why the Montreal Protocol worked. 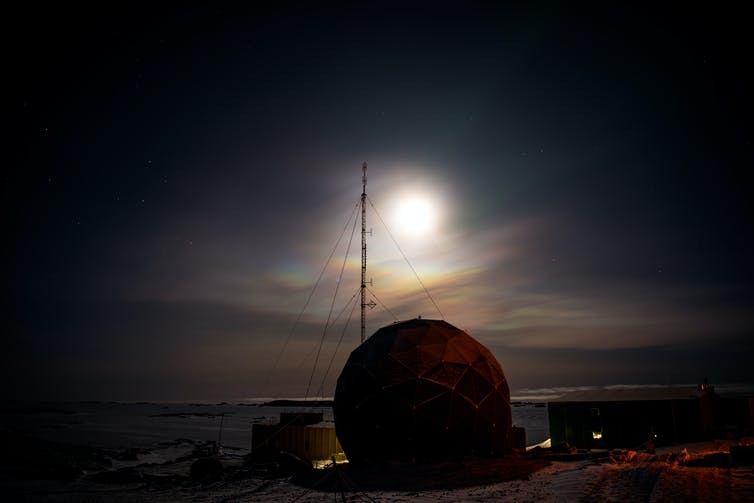 While annual monitoring continues, which includes measurements under the Australian Antarctic Program, a more comprehensive assessment of the ozone layer’s prospects is set to arrive late next year. Scientists across the globe, coordinated by the UN Environment Program and the World Meteorological Organisation, are busy preparing the next report required under the Montreal Protocol, called the Scientific Assessment of Ozone Depletion: 2018. This peer-reviewed report will examine the recent state of the ozone layer and the atmospheric concentration of ozone-depleting chemicals, how the ozone layer is projected to change, and links between ozone change and climate. In the meantime we’ll watch the 2017 hole as it peaks then shrinks over the remainder of the year, as well as the ozone holes of future years, which will tend to grow less and less large as the ozone layer heals.